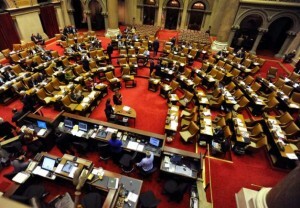 New York Files Online Poker Bill - But is it Already Too Late? It appears that online poker regulation for New York in 2015 isn’t dead after all. New York State Senator John Bonacic has filed a new online poker bill for the state that will make it the fourth to legalize the game, that’s if it actually moves forward. The bill is S 5302 and is nearly identical to the bill filed by Bonacic in 2014. However, there is one major difference in the two bills that will make the process easier should lawmakers try to move forward in 2015. The maximum number of licenses available to providers is 10 but they will be valid for 10 years each. Providers must each pay a $10 million license fee and be taxed at 15% of Gross Gaming Revenue. Both providers and significant vendors must be licensed by the Commission. Significant vendors would include payment processors, marketing companies, etc. The bill will allow New York to enter into interstate compacts. This could be a huge selling point now that the interstate network has been established between Nevada and Delaware. Finally, once the bill is passed, the Commission has six months to draft regulations and issue licenses. The most significant change in S 5302 from last year’s bill is the lack of a bad actor clause. Bonacic had included such a proposal last year but this year’s version conspicuously lacks such a clause. One can assume that this omission has come about because of changing views by many major players in the industry, including Caesars. Also, the ongoing delays in California thanks to the bad actor clause may also play a part in the role. Finally, let’s not forget that PokerStars is expected to begin operations in New Jersey in late 2015. With such a major force of online poker next door, Bonacic may be taking an “if you can’t beat them, join them” approach. Does the Bill Have a Chance to Pass This Year? The question now remaining is whether S 5302 has a realistic shot of passing this year. Most analysts would agree that the answer is no, mostly based on the lateness of starting the process. Back in January, Assemblyman Gary Pretlow told Gambling Compliance that a bill passing this year was unlikely. He did that that there may be hearings on the matter. However, time is running out on the 2015 legislative session. The New York state legislature adjourns on June 17, leaving merely a month to move a bill forward. Odds are that this matter will roll over until next year. If anything, this bill was a step in the right direction for New York but they took the step too late to make an impact this year. Hopefully they will move quicker in 2016. Tagged New York online poker legalization, New York Online Poker Legislation, online poker New York. Bookmark the permalink.